So you built the resume, crushed the interview, and—lo and behold—you got an offer. Actually, you have two. What do you do next? Don’t worry—just read our guide and learn how to decline a job offer. If you find yourself in the enviable position of being able to decline a job offer, be smart; don’t burn bridges with a company whose offer you’re turning down. You’re in a delicate situation when you have to turn someone down, so it’s important you know how to politely decline a job offer. Our tips and template will help you come away looking professional when turning down a job offer, and you’ll be sure to maintain a good relationship with the company. So read on to learn how to reject a job offer like a professional. Gratitude is the most crucial emotion to convey. The hiring manager has spent hours going over your application, looking into your work history and references, and talking with colleagues about bringing you on. You should be flattered to have received the job offer—now is the time to show that. Have some respect for the company’s time and give them your answer as fast as possible. They will want to move forward with another applicant, and if you delay you are costing them unnecessary time and effort. Be honest as to why you’ve chosen not to join their company. They’ll appreciate the honesty. Avoid using the situation as an opportunity for critiquing them, but you can let them know you feel their position isn’t a good fit for you. You never know—if you explain that you don’t feel like a particular position is a fit for you, they might offer you another role that is a good fit for you. You never know when you’ll run into people, and it’s remarkably common if you are working in the same industry. When declining a job offer, tell the company that you look forward to running into them or seeing them in the future. This point is especially important if things should go wrong at the company where you’ve accepted work. Thank you so much for the offer to work as a [Position Title] at [Company Name]. I very much appreciate your time and consideration, and your effort in answering my questions and helping me navigate the application process. I was very happy to meet you and [Names of Other People in Interview] on [Interview Date]. I’ve enjoyed getting to know you and everyone at [Company Name], and hope we have the chance to meet in the future. Again, thank you for your consideration and the generous offer. I wish you all the best. For whatever reason, if things don’t work out at your new job, a good relationship with the company you previously declined may be beneficial. You could even check in with them again and see if the position has been filled, or ask if anything else is available. Hopefully you don’t find yourself in this situation, but if you do, it’s wise to build and maintain your previous connections. Be careful though—it could sound like you’re the type of worker that jumps ship easily. Make the conversation about how much you want to be at their company and why you’ve changed your mind. Give an honest reason as to why you’re leaving, and above all, be earnest. I hope things are going well at [Company Name]. Interviewing with you on [Interview Date] was a positive experience and I was hoping to reach out and touch base with you. In my time at my current job/[Current Company Name], I’ve learned that the position isn’t quite what I had expected. I’m writing to inquire if the position with your company was still available, and if not, if you perhaps were looking to bring someone on in another function. I have attached my updated resume and cover letter. I would love to discuss any opportunities that may be available at this time. I’m looking forward to hearing from you. Thank you for your continued consideration. 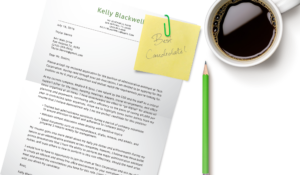 Even after you’ve found a new job, keep your resume updated! Check out our resume template library or create your own using our free resume builder.